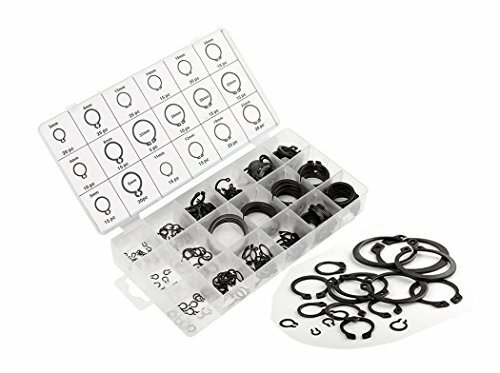 300 Piece C-Clips External Snap Ring Black Washer Hardware Cir Clip Retaining Ring Set For Industrial Fasteners 18 Sizes by UI PRO TOOLS at In The National Interest. MPN: U2390356. Hurry! Limited time offer. Offer valid only while supplies last. PACKAGE - 300 Piece Snap Ring assortment with ATE PRO.USA plastic organizer case. CONVENIENT - The complete set of durable snap rings comes organized in a divided case for easy portability, storage and quick identification. HIGH QUALITY - Heat-treated steel with black oxide finish to resist rust and corrosion. A WIDE ASSORTMENT - This set include 18 sizes of clips for a wide variety of securing tasks around the shop on home. VARIOUS SIZES - 20 pieces of 1/8"; 10 pieces of 5/32", 15 pieces of 3/16"; 25 pieces of 1/4" 15 pieces of 5/16"; 20 pieces of 3/8"; 15 pieces of 7/16"; 15 pieces of 15/32" 20 pieces of 7/8"; 15 pieces of 1"; 15 pieces of 1 1/16"; 10 pieces of 1 1/8"; 5 pieces of 1 1/4" 25 pieces of 1/2"; 15 pieces of 9/16"; 20 pieces of 5/8"; 25 pieces of 3/4"; 15 pieces of 13/16"
View More In External Retaining Rings. If you have any questions about this product by UI PRO TOOLS, contact us by completing and submitting the form below. If you are looking for a specif part number, please include it with your message.